Nestled in center of the French Quarter overlooking the Mississippi River, Jackson Square is one of the area's most prominent landmarks. Home to numerous historic buildings and a thriving arts scene, this popular 2.5-acre swath of land attracts over 2 million visitors each year. Enjoy live music events, festivals and plenty of fascinating architecture in an area rightly dubbed a "place where people want to be." Are there any historic buildings in Jackson Square? 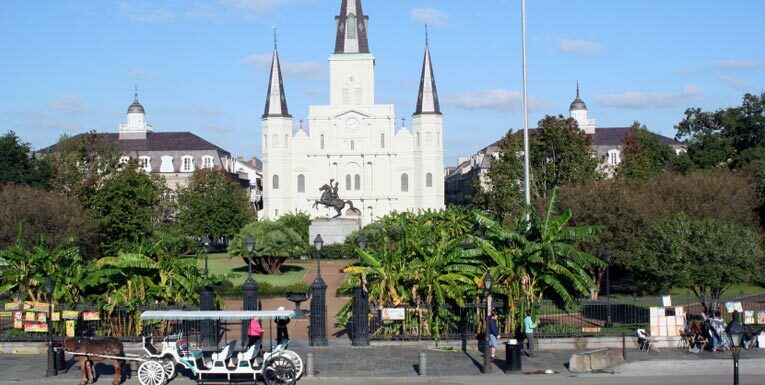 One of the area's most famous landmarks, Jackson Square features an array of historic buildings, including Cabildo, the Presbytere and St. Louis Cathedral. It also plays host to the Lower and Upper Pontalba Apartments, the oldest apartment buildings in the United States. Can you get married in Jackson Square? Hosting hundreds of ceremonies each year, Jackson Square is one of the area's most popular venues for weddings and formal photography sessions. For more information about costs and booking arrangements, visit www.nola.gov/parks-and-parkways/event-rules-regulations/weddings-in-jackson-square/.